It is my pleasure, as the Chairman of the Board of the Lakshman Kadirgamar Institute of International Relations and Strategic Studies to introduce our distinguished guest speaker, Hon. 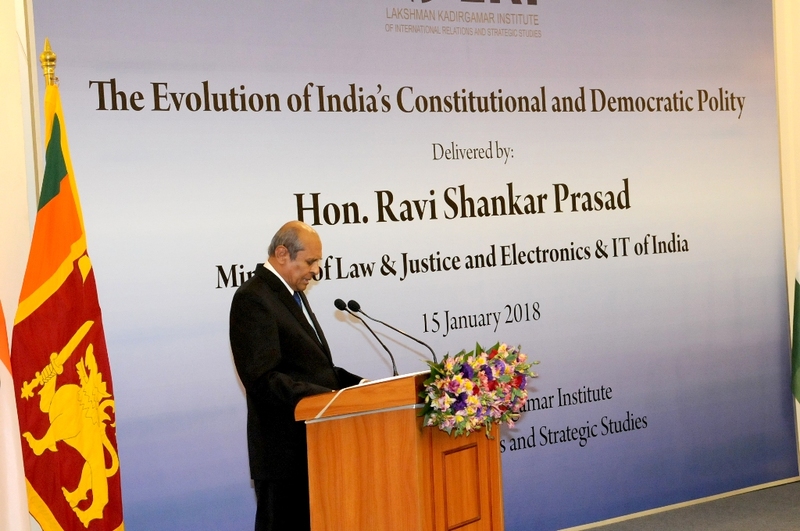 Ravi Shankar Prasad, Minister of Law & Justice and Electronics & Information Technology of the Government of India. I am glad that Hon. Prasad has been able to accept our invitation to deliver the Lakshman Kadirgamar memorial lecture this year. 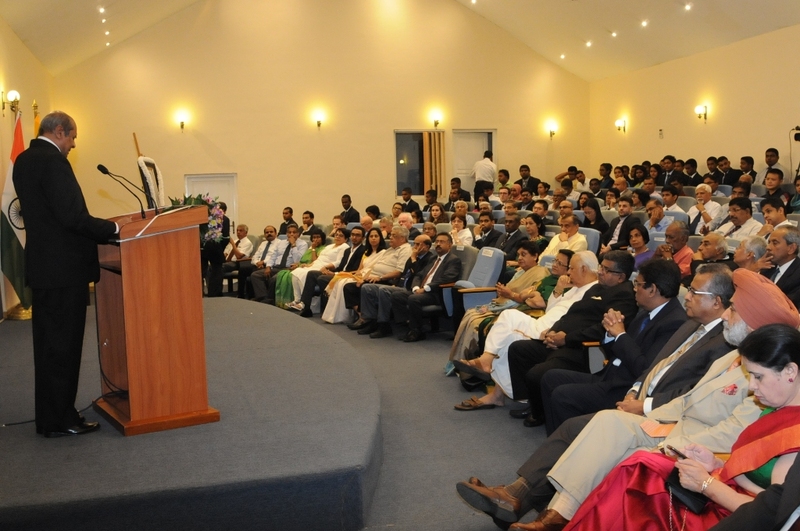 Late Sri Lankabhimanya Lakshman Kadirgamar, in whose memory this lecture is held, is an illustrious son of Sri Lanka. 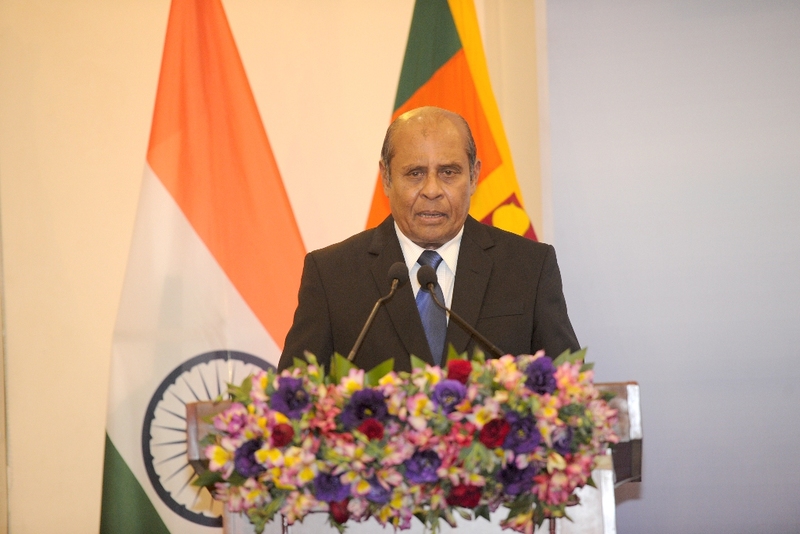 After an extensive practice in Civil Law as a President’s Counsel and a number of years service as Head of Asia Pacific Division of the World Intellectual Property Organization, Mr Kadirgamar entered politics as an appointed member of Parliament in 1994 and was appointed as the Foreign Minister of Sri Lanka, a portfolio that he held twice from 1994 to 2001, and from April 2004 to August 2005, until his assassination. He was prophetic about the evolving global threats due to terrorism and called upon the democracies of the world to stand together to fight this global menace. He was also a very strong advocate of democracy and human rights. Mr Kadirgamar was most importantly a true gentleman. Both in his conduct and at heart. Mild, soft spoken and understanding it was not at all difficult to assess him as a genuine friend after even a brief encounter. He was loved and admired by the people of this country. He enjoyed the respect and admiration of his counterparts and leaders of foreign countries, and all those who had the privilege of meeting him. All this was possible for him because of his qualities, not his knowledge and intellect alone which of course, he had in abundance. Anyone could read up and acquire knowledge but it is not possible for everyone to get the love, respect and admiration that Mr Kadirgamar enjoyed, due to his inherent gentlemanly disposition. I cannot fail to mention the love and support he got from his wife Suganthie and I would credit a good portion of Mr Kadirgamar’s success to his wife Suganthie. It is partly demonstrated by her untiring efforts in having this memorial lecture organized for the past 12 years or so and the extent to which she went to visit India and persuade Mr Kadirgamar’s friend Hon Ravi Shankar Prasad to deliver this memorial lecture. 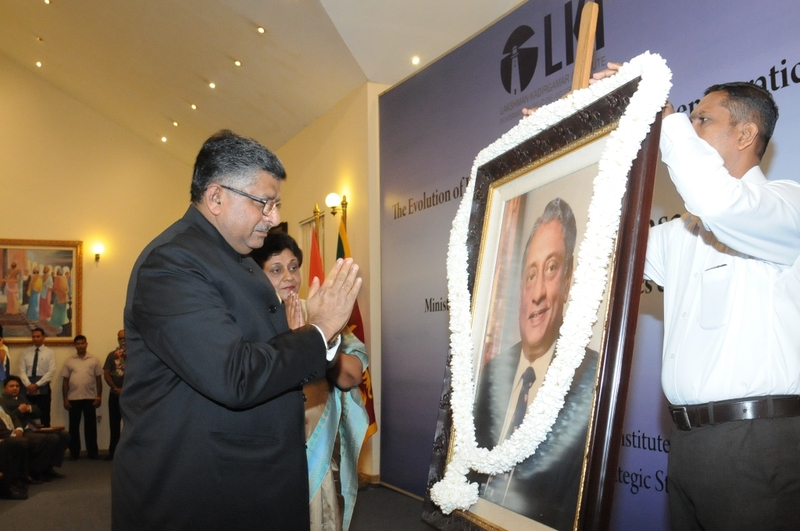 Late Lakshman Kadirgamar was a friend of India, and worked tirelessly towards further enhancing and nurturing relations between our two countries. Amongst his distinguished friends in India were many illustrious political leaders. Therefore, it is a matter of particular satisfaction in having Hon. Ravi Shankar Prasad, Minister of Law & Justice and IT of the Government of India to deliver the Lakshman Kadirgamar Memorial Lecture. Our guest speaker Hon. Ravi Shankar Prasad hails from an illustrious family in Patna, Bihar. A lawyer by profession like his father, he made his name as a prominent lawyer in different branches of law including Constitutional Law, Public Law, Corporate & Criminal Law. His practice was mainly confined to the Supreme Court. During his college days, Hon. Ravi Shankar Prasad has been a student activist and later he has been a human rights and civil liberty activist. As a political activist and organizer, he was the founder of Jansangh in Bihar and was its President for 10 years. He also held the portfolio of Industries in the State Cabinet of Bihar. He has held national level assignments in the youth wing of the BJP over the years. He became an MP in 2000 and became a Minister of State (Coal & Mines) in 2001 in the Government of Hon Vajpayee. Hon Prasad was given the additional charge of the Minister of State in the Ministry of Law & Justice in July 2002. He became National Spokesperson in 2006 and was re-elected again to the Parliament (Rajya Sabha) from Bihar in April 2006 for the second term and in April 2012 for the third term. He was appointed Minister of Law & Justice and Minister of Telecom & IT in May 2014. His impressive Biodata is much longer. I might summarize and say that Hon Ravi Shankar Prasad is today a much sought after Cabinet Minister in Prime Minister Modi’s Government with a bright future ahead of him. The theme the guest speaker has selected is “the evolution of India’s Constitutional and Democratic Polity” and it is a subject quite topical to commemorate a person such as Lakshman Kadirgamar who believed in resolving differences through democratic means and Constitutional reform. Ladies and gentlemen, let me now, as the Chairman of the Lakshman Kadirgamar Institute, invite Hon. Ravi Shankar Prasad to deliver this year’s Lakshman Kadirgamar Memorial Lecture.